With a 3 & 5 year old, I wouldn’t have my table in the house without Protecto Flex!! It's great to know the kids aren't going to get jabbed with a rod. Protecto-Flex...designed by a fooser, for safety. "Protecto Flex" through my personal experience as a foosball enthusiast, I theorized that a new type of bearing nut could be developed that featured a section of polycarbonate tubing incorporated into its design, making the table safer for both players and spectators. 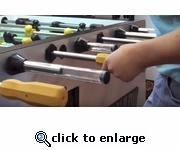 This will prevent an individual standing near the table, particularly a small child, from being hit with the rod and injured, and would enhance safety around a foosball table. Thank you Spirit Getsome Mollice for your contribution to our sport's safety. ​A: You simply remove your existing bearing nuts, and replace them with Protecto Flex. Q: Does Protecto Flex really make my Tornado table safer? A: YES! As a parent you will no longer worry about your child being injured by a fast - moving rod. Q: Are Protecto Flex rod protectors durable?​ Are they easily breakable? ​A: Protecto Flex is extremely durable. They are made of nylon and polycarbonate tubing and will with stand heavy use. Your standard table bearing would break first, because they​ are made out of ABS. Q: Does Protecto Flex work on all Tornado Tables?